Whoa. I don’t even know how to start this. *wipes eyes one final time with pajama top* Yes it’s 4:11pm and I’m still in my pajamas. I couldn’t help it! Plus it’s Sunday. Plus, I deserve to be in my comfortable pj’s ’cause this book tried to kill me, you guys. It tried and tried, and I’d get back up, growl at it, or roll my eyes at it, or complain to my husband about it (at some points, I was so mad, that HE wanted to throw my iPad across the room). Or maybe it’s ’cause I kept interrupting his Call of Duty playing with my plaintive whining about the over-the-top, self-induced angsty character that was driving me batty. But even in all of my eye-rolling, my shrieks of “I wanna shake her! !” and “Can someone just please smack her? HARD!!? ?” (okay I actually said some way-worse things, here, but I’ll spare you ;)), I couldn’t put it down. It tried to take me down, but I kept getting right back up, because there was just something so intense that had me coming back for more. He pointed back and forth between us. It’s so sweet. So falling-in-love worthy. So heartbreaking. The writing? Yep. My ability to connect even though, at times, I was so freakin’ frustrated with the main characters, I couldn’t contain myself. I was mad at myself that I couldn’t just… walk away from the book. It had a “je ne sais quoi” that wouldn’t let me go, even though my logical mind was mad at pretty much… the whole thing. It’s amazing how in just a few hours my entire world came crashing down around me and I just stood there to watch it happen. The moments of self-loathing… the self-deprecation. That’s when I realized. This sweet seemingly YA (but not for long – they become adults soon enough) love story/life story had a darkish side. A “gentler” dark side wrapped up in the precious yellow sunshine of a love story of hope. It was the first time he called me by the nickname that would stick with me forever. Awwww I LOVED his name for her. “Tweet”. It snuck up on me. It’s addicting, it’s unputdownable, and at times it’s simply ridiculous. It’s realistic. And then it’s so unrealistic. I even thought to myself, wait… do people really think like this? Do people really act like that? I found myself exclaiming “Oh please… spare me the self-induced melodrama!! It’s ALL YOU!!! !” and yet, I loved the story (or the feel?) as a whole. I didn’t know what to say, so I did what I usually do. I ran. But I had to continue reading. *shrug* I went with it. I had to know where it was going. There’s only one person in my life who reigns over whether or not I’m lonely. Whether I’m physically with him or not, knowing he’s in my life keeps the loneliness away. When he’s standing in front of me and I feel him slipping away, the ache of loneliness takes over and drowns me. Being that vulnerable to a person is frightening. And like I’ve said before with characters like this girl… maybe there are people just like her who’ve thought the things she has thought and reacted in similar ways. Who am I to say different? I’m different from her (and them.. yes). And while I felt some of it was drama for the sake of drama, I must admit, as a young teen/college student I’ve had my bouts of melodrama, self-centeredness, self-sabotage and even self-sacrificing moments. Noah’s happiness was the most important thing to me. I wanted him to be happy even if it meant I was miserable. It’s what being human and being alive is all about. Fear. Insecurities. Control (hehe, not that kind of control – this is not that kind of “dark”). So even if I couldn’t 100% relate to her actions and her thoughts, I was still so connected to her. This book made me feel things DEEP. I internalized a lot of it. Characters infuriated me. Scenes exasperated me. She exhausted me. The book kept coming at me, and then it tried to take me down, and then when I started sobbing, I knew it succeeded. I couldn’t believe the… direction it took. The surprises that came at me. A few of ’em. You just wait. Oh I had the perfect “clever” start for this review (while I was still reading the book) that had me giggling. I crack myself up sometimes. But suddenly, my clever/silly start to my review no longer had the right impact. Because when I came up with that “start” I was so sure I knew where the story was going so I had already started formulating my review notes. But the story took a turn, and I had to, also. It knocked me down, and I had to right myself. There was a certain depth to the story (what I learned, what I took in, and what I took from it) that knocked the “silly” right out of me. I won’t say much other than it’s about two absolute best friends (Noah and Amanda) that were raised together and had the most AMAZING beautiful friendship (from the very start) that I only wish I could have had (think… “Sweet Gum Tree” in terms of that soul-deep connection). But they grow up, you know. And while both come from truly loving, stable homes, this still goes to show you that even people from a “normal” childhood might have issues. It’s not perfect, no. Again, some of the over-the-top “decisions”, personal introspection and character reactions could almost be toned down to a more relatable (less exaggerated, more natural) level. I’m giving that a pass though, since 1.) they were young, and 2.) there needed to be growth, and it would come with time. And I (er… I mean, she) needed something to compare it to. To learn from. And in the deeper, more meaningful moments (the bulk of the story – for me) I wish there was more of that. Oh it’s intense, and it’s meaningful, but for as much feeling and time that the author took in the more “excessive” stages of this love story, I felt that there was slightly less… hrmmm… volume? in what to me, was the most amazing, touching, maturing part of the story. The growth. The character evolution. I’d say it felt a bit “rushed” compared to all of that… beginning part. But… I loved it nonetheless. BUT my feeling side wants to give it 5 stars (’cause it was so mad, so happy, so sad, so enamored, soooooo…. *my lips are sealed*). 😉 P.S. Not necessarily in that order. P.S. The title of this book? Wow. Just WOW!!!! I didn’t get it. I do now. P.P.S. This IS a standalone. P.P.P.S. 😉 My husband actually purchased it last night for me (I like him to choose for me sometimes – I went into this not knowing a single thing) – and boy can he pick a read! Lise… did you cry? I had to warn my husband to go do his “stuff” ’cause I just knew I had to cry. Yes, I cried and in front of my 17 year old son this morning right before I made him pancakes. I blaimed on his starting his senior year of High School in a week… eek. Didn’t you LOVE Dalton? I’m also curious about Brad. I WILL absolutely be reading that one when it comes out. Well I now have my next read !!! I need something to help me come down from Extinguish that’s for sure! Can’t stop thinking about it!!! Great review Maryse. I had heard I would be sobbing so I locked myself away and read this one all day today. Tweet got on my nerves to a degree, but oh my Noah, and then Dalton! I am also so intrigued by that Brad tease at the end. Can’t wait to read that one. Great review Maryse!! I’ve got to read this book!! Kirsten… yes that tease has me ready for more! Oh no maryse I’m nervous hehe starting it right now!! Oh yes… I love a good book-cry, but I dread it when I feel it coming on. Perfect review….couldn’t put it down. Felt every emotion and times wanted to shake her. Beautiful story! This book was amazing! So glad you liked it too! So, I totally shifted my TBR list and downloaded this late last night after reading the reviews. I could not put it down, but stupid work got in the way this morning! I am only at 30%, but anxious as all hell! OMG! Read this book in one day! What a book hangover I have…..kept waking up in the middle of the night thinking about their whole story! Highly recommend this book to everyone! Now, what to start next…. I loved this book! I actually went back and read some of the more emotional parts over (a couple times)…including the end! Just loved it!!!! Wow, gonna have a massive book hangover from this one, so powerful and infuriating …and beautiful…and heart wrenching yeah wow! This book hurt!! I have a wicked book hangover right now because I could NOT stop reading last night. I haven’t had a book make me physically ache like this since thoughtless. Or was it effortless? Eh, they all did it to me but this hurt. (Oh, which reminds me….how about that dbag reference?! i love it when authors do that :). I had an extra hard workout this morning to get all the angst out of me!! And omg, it had me going right up to the very end!! Usually, if I’m emotionally involved in a book, when you get in the 80-90% range you can breathe easy and ride the end of the story on down the hill. But sweet mother of god, not this one!!! Anyway, I don’t think I’ve ever actually commented on your site before, but you are amazing for recommending the books that I love. And hate, all at the same time ;). So thanks, and keep up the good work!! These authors probably owe a lot of acknowledgements to you!! I know I one click entirely too often 🙂 I don’t even mess around with samples anymore if its something you are giving 4 or more stars too!! Is this book a young adult book?? Does it have any steam or all tears?? I totally agree with your review. I thought it got a bit too wordy and repetitive, as “Tweet” kept repeating her mantra. I must say this book had me in tears at several parts and although there was a HEA, I cried like a baby at the end. If you have a family member that has been what she was going through it makes it more heartfelt. Loved the book and would highly recommend. I love this book so much! When a book grabs a hold of your heart then rips it out of your chest and then puts it back, that’s a win! I wanted a deep book that made me feel, like really feel and this book delivered. And the guy…. WOW. He made me yearn to meet a guy like him, he was soooooo swoony. I love love love Noah! It was a 5 star for me. Hey, I’ve recently read this book and it was amazing!!!!!!! I feel the same way. 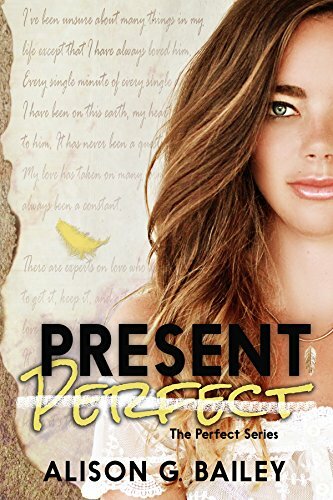 What other reads do you recommend that’s similar to Present Perfect?